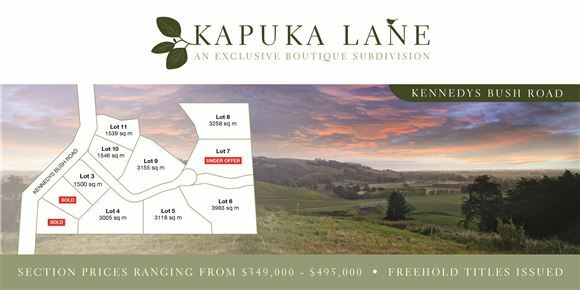 Here is a special opportunity to build your own mini estate in the boutique subdivision of Kapuka Lane set in Kennedys Bush. Each section will offer commanding views of the rural country side and winery below. Each site has been designed with care to protect the view from the building platform and with the spaciousness of each site you can select where to place your new home to ensure maximum sunshine with maximum views. 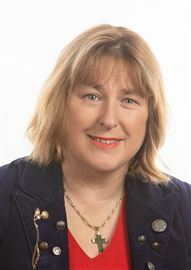 This is a chance to have a taste of country life with city living benefits. Kapuka Lane consists of eleven sections (six of which are already sold), each having a gently sloping building platform and facing to bask in the evening sun. The majority of the sections are gently sloping with the larger sections that have a steeper part still retaining a large potential easier sloping area to build your home. Ranging in price from $305,000 to $405,000 and in size from 1500m² to 3258m² and each title issued, immediate possession is available to give you the opportunity to begin your new dream home.